This article is about the Egyptian ruler. 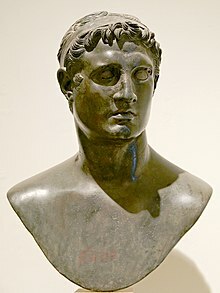 For the son of Cleopatra VII and Mark Antony, see Ptolemy Philadelphus (son of Cleopatra). For the medieval Italian count, see Ptolemy II of Tusculum. Ptolemy II was the son of Ptolemy I Soter and Berenice I. He had two full sisters, Arsinoe II and Philotera. He was educated by Philitas of Cos.
Ptolemy II had numerous half-siblings. 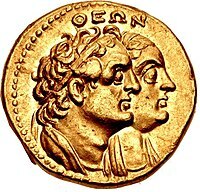 Two of his father's sons by his previous marriage to Eurydice, Ptolemy Keraunos and Meleager, became kings of Macedonia. The children of his mother Berenice's first marriage to Philip included Magas of Cyrene. Pyrrhus of Epirus became his brother-in-law through marriage to Ptolemy's maternal half-sister Antigone. Ptolemy III Euergetes, his successor. After he repudiated Arsinoe, he married his full sister Arsinoe II, widow of Lysimachus, which brought him her Aegean possessions. He also had several concubines. With a woman named Bilistiche he is said to have had an (illegitimate) son named Ptolemy Andromachou. He had many mistresses, including Agathoclea (? ), Aglais (?) daughter of Megacles, the cup-bearer Cleino, Didyme, the Chian harp player Glauce, the flautist Mnesis, the actress Myrtion, the flautist Pothine and Stratonice. His court, magnificent and dissolute, intellectual and artificial, has been compared[by whom?] with the Palace of Versailles of Louis XIV of France. Ptolemy deified his parents and his sister-wife after their deaths. Ptolemy II began his reign as co-regent with his father, Ptolemy Soter, from c. 285 to c. 283 BCE, and maintained a splendid court in Alexandria. Egypt was involved in several wars during his reign. His maternal half-brother Magas had declared himself king of Cyrene in 276 and began a war against Ptolemy's government in 274 BCE. Magas managed to keep Cyrenaica independent of the Ptolemies until his death in 250 BCE. Magas' attack on the Ptolemies began when their armies were in the east; Seleucid emperor Antiochus I Soter had attacked Coele-Syria with Judea in the First Syrian War. Two or three years of war followed. Egypt's victories solidified the kingdom's position as the undisputed naval power of the eastern Mediterranean; his fleet of 112 ships bore the most powerful naval siege units of the time, guaranteeing the king access to the coastal cities of his empire. The Ptolemaic sphere of power extended over the Cyclades to Samothrace, and the harbours and coast towns of Cilicia Trachea, Pamphylia, Lycia and Caria. In 275/4, Ptolemaic forces invaded Nubia and annexed the Triakontaschoinos. The victory won by Antigonus II Gonatas, king of Macedonia, over the Egyptian fleet at Kos (between 258 BCE and 256 BCE) did not long interrupt Ptolemy's command of the Aegean Sea. In the Second Syrian War with the Seleucid Empire of Antiochus II Theos (after 260 BCE), Ptolemy sustained losses on the seaboard of Anatolia and agreed to a peace by which Antiochus married Ptolemy's daughter Berenice Phernopherus (c. 250 BCE). Ptolemy was of a delicate constitution. Elias Joseph Bickerman gives the date of his death as 29 January. The material and literary splendour of the Alexandrian court was at its height under Ptolemy II. Pomp and splendor flourished. He had exotic animals of far off lands sent to Alexandria, and staged a procession in Alexandria in honor of Dionysus led by 24 chariots drawn by elephants and a procession of lions, leopards, panthers, camels, antelopes, wild asses, ostriches, a bear, a giraffe and a rhinoceros. According to scholars, most of the animals were in pairs - as many as eight pairs of ostriches - and although the ordinary chariots were likely led by a single elephant, others which carried a 7-foot-tall (2.1 m) golden statue may have been led by four. Although an enthusiast for Hellenic culture, he also adopted Egyptian religious concepts, which helped to bolster his image as a sovereign. Callimachus, keeper of the library, Theocritus, and a host of lesser poets, glorified the Ptolemaic family. Ptolemy himself was eager to increase the library and to patronize scientific research. He is thought to be the patron that commissioned Manetho to compose his Aegyptiaca. The tradition preserved in the pseudepigraphical Letter of Aristeas which connects the Septuagint translation of the Hebrew Bible into Greek with his patronage is probably overdrawn. However, Walter Kaiser says, "There can be little doubt that the Law was translated in Philadelphus's time since Greek quotations from Genesis and Exodus appear in Greek literature before 200 BCE The language of the Septuagint is more like Egyptian Greek than it is like Jerusalemite Greek, according to some." ^ "Ptolemy II Philadelphus". Livius.org. ^ Clayman, Dee L. (2014). Berenice II and the Golden Age of Ptolemaic Egypt. Oxford University Press. p. 65. ISBN 9780195370881. ^ Konstantinos Spanoudakis (2002). Philitas of Cos. Mnemosyne, Supplements, 229. Leiden: Brill. p. 29. ISBN 90-04-12428-4. ^ Macurdy, Grace Harriet (1985). Hellenistic Queens (Reprint of 1932 ed.). Ares Publishers. ISBN 0-89005-542-4. ^ a b "Pharaohs of Ancient Egypt". Ancient Egypt Online. Retrieved May 22, 2013. ^ Hinds, Kathryn (September 2009). Ancient Celts: Europe's Tribal Ancestors. Marshall Cavendish. p. 38. ISBN 978-0-7614-4514-2. ^ Scullard, H.H The Elephant in the Greek and Roman World Thames and Hudson. 1974 pg 125 "At the head of an imposing array of animals (including...)"
Marquaille, Céline (2008). "The Foreign Policy of Ptolemy II". In McKechnie, Paul R.; Guillaume, Philippe. Ptolemy II Philadelphus and his World. Leiden and Boston: BRILL. pp. 39–64. ISBN 9789004170896. O'Neil, James L. (2008). "A Re-Examination of the Chremonidean War". In McKechnie, Paul R.; Guillaume, Philippe. Ptolemy II Philadelphus and his World. Leiden and Boston: BRILL. pp. 65–90. ISBN 9789004170896. 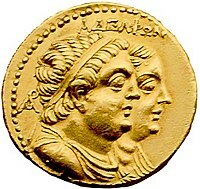 Wikimedia Commons has media related to Ptolemy II.